November | 2008 | Two cultures, one mind. Inspired by Rob Mile’s posting, I’ve been playing with PortableApps.com. All the machines at University are windows-based, and very Microsoft-focused, the idea of having a range of Open Source applications on a Pen Drive is something which does appeal. I need to nod towards Web Worker Daily, which pointed me in the direction a while back. The full installation (from portableapps.com was straightforward, but very, very slow, some people commented on it taking 10 minutes onto a USB drive, mine took getting on for four times that length). I love the menu and the interface, but unfortunately none of the applications worked on the university network, due to firewall issues. I will take some time configuring the applications which I know I can adjust to work through the uni firewall, but it’s not been the instant gratification experience which I was hoping for. There is a mac equivalent, called MacLibre, but as I only have regular access to two mac machines, both of which I own, it’s not really useful for me. I’m sure PortableApps fills a niche, and I will keep the suite on a pen drive ‘just in case’, and for when I access windows machines I’ll always know I’ve got a suite of programs with me, but it’s not the great tool which I hoped it would be. Imagine if you can that there’s been an all-out war, and that you’re trapped in a nuclear bunker, not with your friends, family and loved ones, but with a dozen Open University advisors. The courtyard centre in Hereford is purpose-built, light, bright and modern and apart from having to spend £2.75 on a slice of cake, a joy to visit. But for reasons best known to themselves they stick us in the studio theatre, which like most theatres has no natural light. It reminds me so much of the school gymnasium, not in smell (that strange mix of wood polish and sweat which I’ve never experienced since), but in the way that noise travels – I can hear conversations on tables ten metres away from me. Still, another couple of hours and I’m done, with another little contribution to the Christmas fund (I may as well simply divert my salary to Amazon and Play.com, and they refund me the difference at the moment). And if you’re in Hereford at the moment, pop in and say hello, I can recommend the Christmas cake! Lousy traffic on the way home from a placement visit yesterday meant that I ended up at IKEA. This is actually less than half a mile from my parents, so I pass it quite often, and their meatballs in gravy is probably as good an excuse as any that I bought a Wii Fit a couple of months ago. Anyhow, I had in mind half an idea to buy a second computer table for my office. There’s often a couple of us working from home, and it’s always good to have somewhere to put my laptop. For £15 it does the job a treat. It can lift to the height of my normal desk, but can also drop down so that I can use it from the sofa… or even bed! It also tilts. 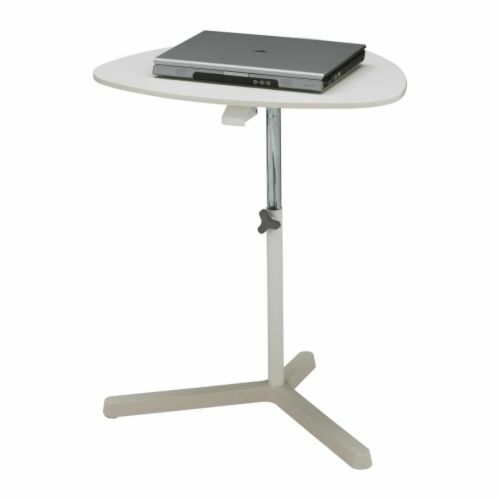 The downside – it’s not as stable a base as a normal desk (it can’t be with only one leg! ), and there’s not much room for my mighty mouse (there is, but you have to move the laptop off centre which makes it rock more). The rest of the day has been fairly steady, with an interesting school meeting about plans for new courses. Have a good weekend everyone, I’m on annual leave on Monday so no posting unless my Christmas shopping goes really techie! As mentioned earlier, here are the findings of a student activity trying to compare three of the most popular product management techniques. These have been transcribed directly from flip chart sheets, and have not been peer compared – you may find contradictions! No formal tools Formal tools e.g. RACI, WBS etc. It’s a frequent classroom activity, to compare and contrast two different ‘things’. When there are just two items it is relatively simple, but it becomes trickier when there are three items. The way I get round this is to use a comparison triangle. It seems common sense, but the students always seem amazed when it ‘works’. The activity yesterday was to compare three PM techniques, PRINCE2 v SCRUM v PMBOK. 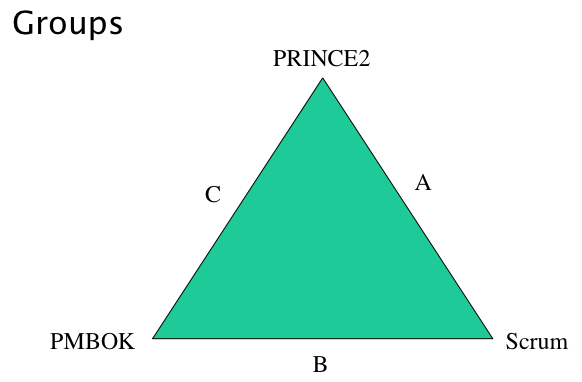 The first thing is to separate the class into three groups – A, B C. I then put the following triangle up (some of my students know how much I ‘like’ triangles. (If you’re doing this ‘ad hoc’, then it’s simple enough to create this on the fly). The ‘points’ are the items, the ‘sides’ are the group letters. So Group A evaluate PRINCE2 v Scrum, Group B evaluates Scrum v PMBOK, and Group C evaluates PMBOK v PRINCE2. As the findings may be of use for other people comparing these techniques, I’ll create a separate posting with the results of this activity, with the caveat that these are the student’s findings, not mine! I’ve added another site to my RSS feeds, this one being LifeHacker. The mix of techie stuff, lifestyle and strangely cooking tips means that you never know what you’re going to find there. One thing that popped up a couple of days ago was a link to iSerenity. The site is simple in style, but does the job, providing a number of ambient noises for background working. I’ve already got my favourites, the restaurant noise is great to help me feel that I’m working where other people can see me, whereas I’ve fallen asleep a couple of times (on the sofa!) to the sound of a train. It’s clearly a niché product, but it works for me where I don’t want the distraction of ‘real’ noise, but don’t want silence. I’m looking forward to trying it at work with headphones on. I’m pleased to say cough/cold-wise I’m back to normal now, and almost running on full power. Looking forward to teaching this afternoon. Whilst I’m still getting better, I’ve had to curtail most of my activities outside work. I had long planned seeing the Christmas lights being turned on at Coven, the local village to me, but foul weather and a healthy dose of common sense had kept me in. So today has been spent sitting on the sofa, with the occassional web surf and working on my creative writing. I’ve also been able to chat to a very old friend who has just discovered the delights of MSN Messenger. He’s asked for my advice about purchasing a webcam. I was able to point him to an earlier posting but the camera I recommended a year ago is no longer available. The closest I think is the Logitech QuickCam E3500 which he’s (hopefully) going to purchase. I’ve not done this before, but I will update the earlier posting with this information, as I still get a fair few hits on this posting. Teaching tomorrow, Tuesday, Wednesday and a placement visit on Thursday – not exactly an easy week, but all par for the course at this time of year I guess. 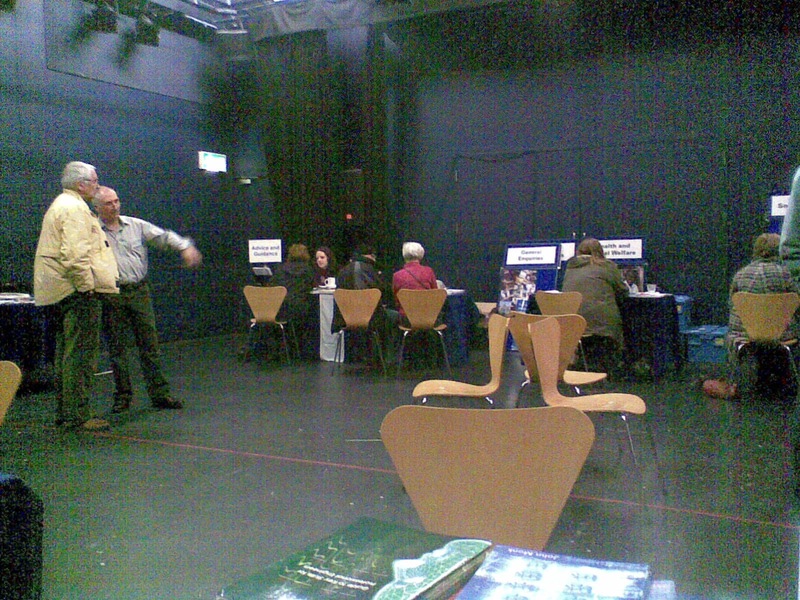 Living together in perfect harmony at the Open Event in Harborne. To connect to the Internet at home you will need an ISP – Internet Service Provider. Over the last few years these have become household names. Prices for broadband connection have fallen dramatically, but one thing to be wary of is that the broadband speeds quoted by many companies are maximum speeds possible. The actual speed you will achieve is dependant upon your distance from the telephone exchange. Some things to look for are ‘bundled’ deals from companies such as TalkTalk, Orange (which used to be Wanadoo, and before that Freeserve! ), and Sky, who offer services alongside broadband. BT of course offers Broadband. If you’re in an area which has cable, then Virgin Media offer similar bundles. Remember however that most broadband providers ask you to sign a twelve or eighteen month contract. Talk to your neighbors about what broadband service they use, and the speeds that they get. Once online you can check the speed of your connection through a web site such as Speedtest will confirm the actual broadband speed you are getting. There has been recent publicity with regard to the ‘capping’ of broadband once limits have been exceeded, though if you only use it for email, surfing and OU work you are unlikely to exceed a gigabyte a month, be wary of peer to peer sharing and downloading video (such as BBC iplayer) as this can eat up your broadband usage. You have to think about whether you want to go ‘wireless’ in your home. Nowadays, these are fairly easy to set up, but follow the instructions provided, and ensure that you have a ‘secure’ wireless network, otherwise anyone parked outside your home, or your neighbors can use your network. You will need a wireless adaptor for each machine that connects to a wireless network, though these are ubiquitous on laptops, and most desktop machines. If you don’t need broadband, then you can still use a Dial-Up connection to access the Internet. You must make sure that your new laptop or desktop has a modem (sometimes called an analogue modem) to plug into your phone line – many new PCs don’t have this, as it’s assumed you will be using broadband. Tesco offers some good deals on dial-up broadband. An alternative to ‘fixed-line’ broadband is mobile broadband (not to be confused with wireless broadband, see above). This is broadband over a mobile phone network, such as 3, or Vodaphone. The prices for this are coming down, and can provide a useful alternative if you are at all nomadic. As a rough guide, expect to pay about £50 for a ‘pay as you go’ modem with data costs from £10 per gigabyte, or you can have the modem for free for a 12/18 month contract with an equivalent cost per month for up to 3 gigabytes. The most recent version of Microsoft Windows is Vista. This comes in five different versions, but for home use there are two main versions. Windows Vista Home Basic runs on older machines, and those with limited memory and graphic cards… any machine up to two/three years old should run Home Basic, and the OS is frequently included on new, bottom of the range PCs. This will be fine for most ALs, however you will not have access to the rich media experience (fancy graphics and usability) of Vista Home Premium – PC’s which offer this operating system will usually cost more. A word of warning, there are horror stories abound of people upgrading their machines from Windows XP to Windows Vista. This is not a simple matter of ‘insert DVD and forget’, ensure that you have a backup of all important files. 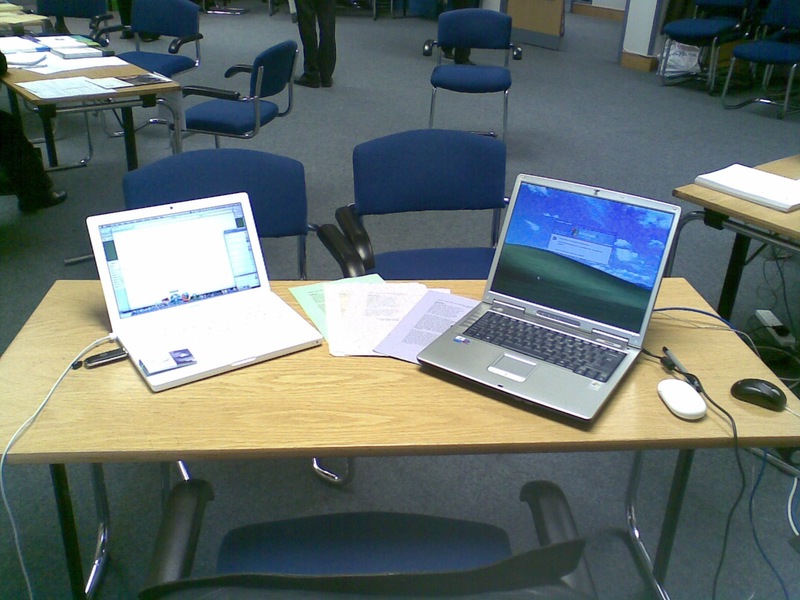 Open Office is provided by the Open University on their Applications CD, for use by students and teachers, but you must remember to save in .doc or .rtf format, otherwise students will be unlikely to see your comments. Remember, that students, and staff should be saving all word processing files in .doc, not the more recent .docx format. There are alternatives to the Internet Explorer browser, which offers greater online security, and perform quicker. Mozilla, Opera (and Safari for mac users) are all valid alternatives, and offer functionality at least as good. Finally, it is important that you back up files and folders. A new development is online backup, where your data is securely transferred across the Internet. Get Dropbox is a useful service to allow you to synchronize files across many machines. Mozy offers a free 2Gb service for both PCs and macs which I have used for months with few problems, including restoring files. If you use the link below, then I get some extra storage space for all who sign up.